bis unsere gefallenen Kameraden zurückgeben. ​until our fallen comrades return. This is the website of the 136th Regiment/2nd Gebirgsjäger Division Re-enactor organization, a group of men with an interest in military history. While many of us are involved with re-enacting and living history groups of other time periods and other armies, this website serves as a resource for the World War II German Gebirgsjäger impression. The German Gebirgsjäger (mountain infantry) of WW2 found its origins in the Alpenkorps of both the Royal Bavarian Army and the Austrian Alpenkorps of WWI, where they were used to defend the mountain passes from their Italian equivalent, Alpini. They were trained to operate in mountainous terrain and cold weather. 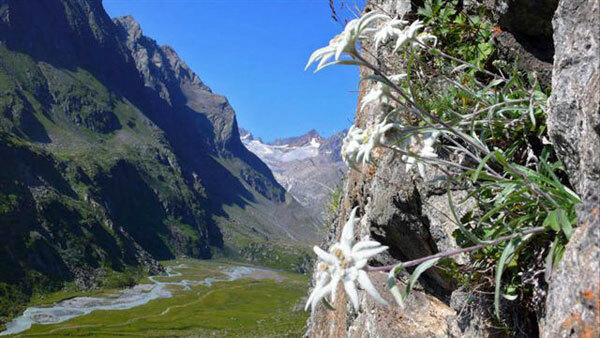 The Austrians chose the edelweiss flower as their symbol in 1907 and this eventually became the universal emblem worn by all mountain troops. The flower only grows at higher altitudes and means "noble purity." Men from the Germanic tribes of pre-Christian Europe would bring these blossoms down from the mountains for their betrothed. That somewhat romantic notion endured through the political turbulence of the 1920’s and the Nazi dictatorship that followed. Both Austria and Germany chose to grow their mountain infantry units in the 1930’s. When Germany annexed Austria in 1938, the Deutsches Gebirgsjäger Divisions were formed. There were 11 divisons of Das Heer (the army); some were mixed Austrian and German, some were exclusively German, and 8 divisons of Waffen SS. With the exception of the 6. SS Gebirgsjäger Division Nord, the SS divisions were raised from the local populations of the Balkan countries and primarily assigned to anti-partisan, rear guard duty. Gebirgsjäger divisions were used in virtually every theatre of WWII: including the invasions of Poland in 1939, Norway in 1940, Africa, Crete and the Balkans in 1941, and Soviet Russia in 1941. Throughout the war they were primarily concentrated in the mountainous areas on the Russian Front: in the Norwegian/Finnish/Lapland region to the north and the Caucusus region to the south. Gebirgsjägers wore essentially the same core uniform as regular infantry with some exceptions—mountain boots (Bergstieffel), the short-brimmed mountain cap (Bergmutz), and a reversible Windbluse (anorak) are the most visible differences. In addition to the core field gear (canteens, mess kits, etc. ), Gebirgsjäger sometimes carried climbing equipment, skis and snow shoes. Weaponry included the K98 Mauser rifle, MP40 submachine gun, MG34 and MG42 machine guns, like their regular army counterparts. A shorter-barrelled K98, called the Gewehr 33/40 was also issued, more suited for carrying into the mountains. The infantry regiments were also supported by anti-tank guns, mortars and howitzers from the division. A typical division numbered about 15,000 men, 1,400 vehicles and up to 6,000 pack animals, ranging from horses of varying breeds to camels. ​A mountain division was comprised of a Division HQ staff, a Reconnaissance Battalion, a Signals Battalion, an Artillery Regiment (with four battalions) an Anti-tank battalion, an Engineer battalion and two Infantry Regiments (as opposed to the three regiments found in regular infantry divisions). The Division was also supported by a back line services group consisting of Supply, Administration, Medical, Veterinary, Military Police and a Field Post Office. The German Army of today still maintains Gebirgjsäger troops. The 2nd Gebirgsjäger Division, represented here, was formed April 1, 1938 from the 6th and 8th Brigade of the Austrian Bundesheer. Its first commanding general was an Austrian, Valentin Feuerstein. The 2nd GJ took part in the invasion of Poland (Army Group South) and were then deployed as reinforcements in the Norwegian campaign. They spent the remainder of the war fighting the Russians in arctic Lapland and were eventually withdrawn to the western front for the defense of Germany in 1944/1945. In the final months of the war they were on the Strasbourg/Karlsruhe front in southern Germany, with the remnants finally surrendering on the northern flank of the “Alpine Redoubt” and near the Danube river in May 1945. The last commanding general was Willibald Utz. The re-enactors in the 2nd GJ Division are made up of men 18 and older who have an interest in military history. They live throughout OH, PA, VA, NY, MD and NJ. Many of them also re-enact other time periods and different armies, including Federal units of the Civil War, the British Army of the Revolutionary War, and the American Army of WWII. About one third of our members are veterans of the U.S. military, which is one reason why re-enacting on the opposing side has some appeal—they are already familiar with the U.S. military, its traditions, equipment, etc. This gives them an opportunity to learn something different. Re-enactors of any side work very hard, spending time and money, to accurately re-create the daily life of an average soldier, and pay attention to the small details—shaving material, postcards, smoking pipes, songs, food, etc. You will find that the knowledge of an individual soldier’s life accumulated by re-enactors is generally not found in the major history books on the shelves of most libraries and bookstores. The events in which we participate range from non-public “tacticals” (unscripted blank-fire battles with Allied re-enactors) and public “living history” events where the public is welcome to tour a typical camp and ask questions. Public events are an important part of remembering the important lessons of WWII and recognizing the hardships and sacrifices experienced by common soldiers.